It's Friday again! Yay! And Canada Day is coming up next week, so I imagine that many of you have an extra-long weekend ahead. But an extra-long weekend is no reason to slack on our reading. As usual, I found 5 interesting pieces this week to keep you learning and investigating for just a bit more before you enjoy the official beginning of summertime. First, it seems that there is a definite decline in search engine traffic, offset by an increase in traffic from social sources. While SEO and SEM are still excellent sources of traffic and good investments for your advertising dollars, you might want to balance that with an increase in your social media presence. It's kind of obvious for anyone who does branding or visual design work, but this GetResponse post covers how your online ads and landing pages should be consistent. Content marketing expert Heidi Cohen (love her stuff!) breaks down a recent "State of Blogging" survey with actionable tips. If you struggle with blogging, there's tons of good advice there. More useful, actionable advice on email marketing from Constant Contact about the four types of emails that your email strategy should always include. This one's going on my favourites list! Uh oh… Google Authorship is removing author picture and circle count from the search results page. If you've relied on Google Authorship for traffic in the past, be ready to change your strategy… again. On this week’s reading list: Email marketing, email marketing and more email marketing. This week was busy with dad stuff, but lots of other things happened on the digital marketing blogosphere. Let’s have a look at this week’s reading list. First, Facebook will let you review your marketing file and edit it. You know when you click “I don’t want to see this ad”? You’ll now be able to see what Facebook does with this information. They’ll also let you choose what kinds of ads you want to see. Are you going to use this new function or do you just glaze over any and all ads? There’s an interesting piece on the Hubspot blog about why CIOs and CMOs should align themselves together. The most shocking thing? 80% of CEOs are not impressed with the work done by marketers and do not trust them. Is this a risk of the job, or do CEOs need to reconsider their attitude? Reuter’s Institute for the Study of Journalism released its annual Digital News Report yesterday. There’s a lot of data to sift through, but here’s something interesting: the “weird news” category is now just as popular or more popular than entertainment news. Weird, indeed! Marketing Land highlights data from a new email benchmark study that shows that top email marketing campaigns get a 9.5% click through rate–but considering that the median is at 1.5%, it’s quite the feat. I think I’ll be happy with my 5% average! “Internet (didn’t) Kill The Newspaper Star”, according to a new study published in the American Economic Review. The study debunks a few myths about online news, including the one that says that the price of attention online is lower than offline. What did you read this week that was interesting or challenged your assumptions? Share your links with us! Good Friday everyone! I hope you had a great week and that a nice weekend is awaiting you. Here in Victoria, the weather has definitely been summery. To finish your week on a reflective note (remember that article from last week about taking time to stop and reflect?) or in learning mode, here are my 5 favourite articles I read this week. This short read from Social Media today covers the basics of using traditional and digital PR to promote your business. Tried-and-true PR techniques still do work, and may even work better thanks to social media. According to a new study, newsletters might just be the most effective way to reach business executives. Marketing Land has the highlights. Detecting sarcasm may be one of the hardest things to do online… but don't worry, the U.S. Secret Service is on the case. They're looking to find a program that will actually be able to differentiate sarcasm from statements. How would you like a personalized experience on the web, every day? Adobe is working on a product that would provide tailored content instead of a static web page that's the same for everyone. This would definitely change the way we distribute and share content. What I really enjoyed about this Hubspot article is its clear articulation of why inbound marketing works. This might just change the way you see online marketing. What's on your reading list this weekend? Share your favourite articles with us. 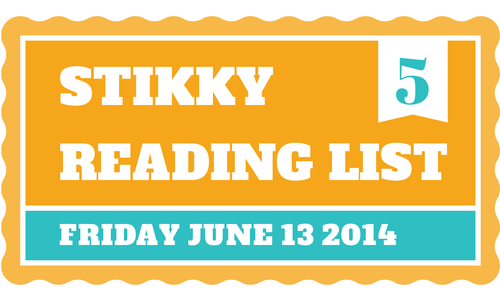 If you wrote something awesome, we'd love to feature you on our Friday reading list!